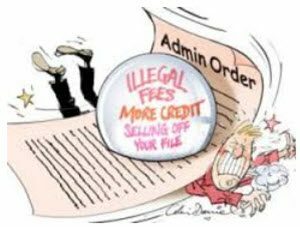 Administration order is a type of debt management available in England, Wales and Northern Ireland. It is not available in Scotland. Administration orders used to be very common, but have today been largely replaced by debt relief orders (DRO). To apply for an administration order, the debtor must have less than £5,000 in total debt and must have received at least one court judgement. The administration order gives the debtor legal protection from the creditors. They are not allowed to contact the debtor to ask for money and they are not allowed to add more interest or charges to the debts. Any kind of debt can be included in an administration order, but the court can decide to leave certain debts out. Examples of debts that are likely to be excluded from the administration order are criminal fines and council tax arrears. You start by filling in an N92 court form. Examples of information that you will provide on this form is your income, your debts and your expenses. Next, the court will decide if a hearing is needed before an administration order can be approved or denied. If your case looks straightforward, the court can decide that no hearing is necessary. Otherwise, you will be asked to attend a hearing. If the administration order is approved, the court will decide how large the monthly payment will be. It is based on how much money you have left after paying for essential bills, living costs and similar. With an administration order, you make one payment to the court each month instead of paying individual creditors directly. The court will then distribute the money to the creditors. In England and Wales, the court can decide to take the payment straight from your wages to prevent you from spending them. They will use an attachment of earnings to accomplish this. If your circumstances change during the administration order period, you can write to the court and ask them to change the size of your monthly payments. You can also ask for the administration order to be cancelled. The court will keep 10% of each payment you make, to cover their administrative costs. For how long will I pay? With an administration order, you will continue to make payments until your debts have been paid in full. Exception: If you can not afford to pay off all your debts within a reasonable time, you can apply for a composition order. If it is granted, the court will set a date for the administration order to end. Typically, they will set the order to last for 3 years. If you make all the payments throughout the administration order period, remaining debt will be written off when the administration order ends. The administration order will be included in your credit file. It will stay there for six years, counting from the date of the order. The administration order appear on the Register of Judgements. It will stay there for six years, counting from the date of the order. This register is open to the public.